Rarely dramatic or complex in aroma, Pinot Blanc is nonetheless amongst the most evocative white grape varieties, capable of making wine that is subtle in flavor, soft and gentle in texture, and remarkably versatile with food. It doesn’t shout, it whispers. One of my biggest wine revelations a number of years ago was blind tasting a twenty year old example from the hills of Trentino, where the grape is most often labeled Pinot Bianco; the light straw-colored wine was still fresh, minerally, pure and absolutely charming. So, in addition to tasting delicious when young and fresh, Pinot Blanc can age too. Why then does it remain so invisible in stores, restaurants, and on almost everyone’s list of favored grape varieties? Fashion. 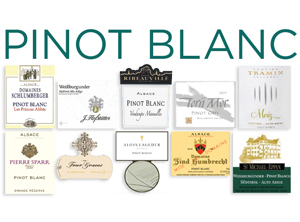 Pinot Blanc suffers a hazy image, its very name lacking identity. Pinot Blanc or Pinot Bianco? Other incarnations are Klevner (in Alsace) and Weissburgunder (in Germany, Austria and sometimes Alto Adige). And, to muddy the picture further, Alsatian Pinot Blanc generally incorporates a very high percentage of another grape that is actually far more anonymous, Auxerrois, while West Coast U.S. versions are often not true Pinot Blanc at all, but transplanted Melon de Bourgogne, a grape responsible for making Muscadet in the Loire Valley’s Pays Nantais. And, whether in Alsace (where it also contributes to blends known as Gentil or Edelzwicker), or in its homeland of Burgundy (where there are some fine varietal examples in Savigny-Les-Beaune and even Morey St.-Denis), or for that matter across the Italian border in Lombardia, Pinot Blanc labors anonymously to make a fine base for traditional method sparklers. Nobody said wine was easy! A recent blind tasting I conducted of international Pinot Blanc (whatever the name on the label says) reinforced my impression that standards are consistently high and the wines generally very enjoyable. In addition, there is an appealing diversity of styles, and a general compatibility with food that suggests to me the wines should be better known. Because of Pinot Blanc’s soft acidity, but generally creamy texture, it’s a natural with scallops or shrimp. It works well with sushi, crab cakes, and seafood dishes in a mousseline sauce. They also are compatible with vegetable or fish dishes with very mild curried influences. A final point of difference: Pinot Blanc is a bargain. If you’re burnt out with the same old same old white wines and are looking to expand your repertoire, the following winners are listed in ascending order of preference. This is one of Alsace’s largest estates and their wines are always solid, especially so since they are undergoing a transition to biodynamic frarming practices. With an earthy, pear-like aromatic profile, accented by dried green herb and spice notes, this lighter bodied wine shows the soft, mellow side of Pinot Blanc, although there are also some intriguing lemon zest and stone fruit notes, and even a hint of green pepper to enliven its personality and balance the gentle Pinot Blanc fruit. Available from United Liquors. From rocky mountain soils, this northern Italian version is aromatically delicate, with a touch of yeast, wheat, cinnamon, and peach. It’s round textured, chalky and bright, with evidence of lees aging, and an engaging finish of toasted hazel nuts. Available from Ruby Wine. A significant percentage of Alsatian wine is made by cooperative agriculture, but unlike some other regions of the world this does not reflect inferior quality, as standards are high across the board. This has an engaging aroma of apple, pear, vanilla (not from oak, but likely from lees contact), corn, pumpkin and orange. It’s juicy and bright, with clean fresh acids. Available from Horizon Beverage Company. This Dundee Hills Winery makes consistently fine Pinot Noir, but this is the first example of their Pinot Blanc I’ve tasted. It’s distinctly floral and melon-like, with hints of honey and baking spice. Yeasty and clean, with medium fruit extraction, its easy-going personality balances a persistently spicy piquant finish. Available from Carolina Wine & Spirits. Just as Alsace is home to several high quality coops, the same is true of Alto Adige. The label of this wine honors the Alpine region’s traditionally Austrian name, Sud Tirol, in addition to its Italian identification. It has a light bacony smokiness, and is a little fuller and more concentrated than some of the other examples. Somewhat rich and nut-like, the palate also features firm citric acidity, leaving a primarily crisp impression in the finish. Available from Winebow. This Alsatian producer’s Pinot Blanc has a breezy garden fragrance of spring apples, peaches, and tarragon. It’s lively, with bright, fresh apple-like notes on the palate, medium texture, and a complex honeyed sweet herbal flavor note. Available from Classic Wine Imports. This Dundee Hills winery produces a delicate Pinot Blanc with notes of white pepper, pear, and spring flowers, along with grace notes of orange peel and wood smoke. It is round and concentrated, with bright juiciness and a tart, lingering apple note. Its floral fruit suggests matching with Thai preparations. Available from Classic Wine Imports. Lageder is one of the top names of Alto Adige, and is especially respected for their organic farming practices. With a lovely perfume of lilies, this is a gentle wine that lands very delicately on the palate. There is a hint of spritz, and a lovely nectarine, apricot-like, lemony note on the palate. The finish is pure mineral. Supple and lively, it would accent the flavors of mild lighter textured shellfish to perfection. Available from Carolina Wine & Spirits. This is one of France’s greatest wine estates, and the grapes for the Pinot Blanc originate primarily in the villages of Rotenberg and Herrenweg (both of which are very high in limestone, although the latter is more gravelly). Creamy lush and ripe, with apple notes and a spicy flinty minerality, this is a very sensual, even exotic Pinot Blanc. Composed of two thirds Auxerrois, it’s aged for 8 months on the yeast lees. Available from Horizon Beverage Company. This lovely wine shows its dual personality not only in naming the grape, but the region as well. Smoky and spicy in aroma, with apple and pear notes, it’s mellow, lush and opulent on the palate, but invitingly lemony as well. Quite concentrated in flavor. Available from Classic Wine Imports. Overall, very impressive. Pinot Blanc may be obscure, but in this age where the collective palate is beginning to prize understatement, it should come to mind as a go-to white wine recommendation if you’re trying to avoid intense tropical fruitiness, strong use of oak, or sharp acidity. It’s also highly complementary to lighter fish and vegan dishes.